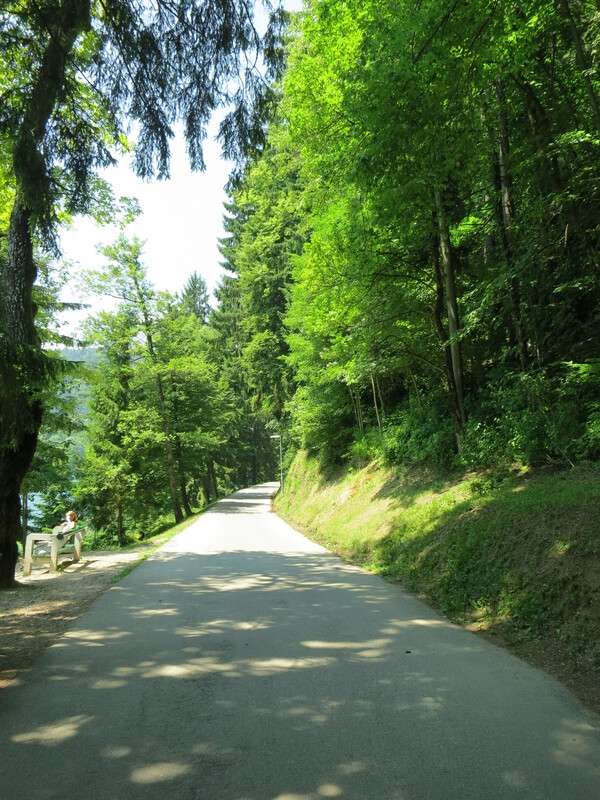 Driving a car in another country makes me more nervous than it probably should, so I generally try to avoid it, which is how I found myself on a daylong tour in rural Slovenia rather than driving myself through the countryside. 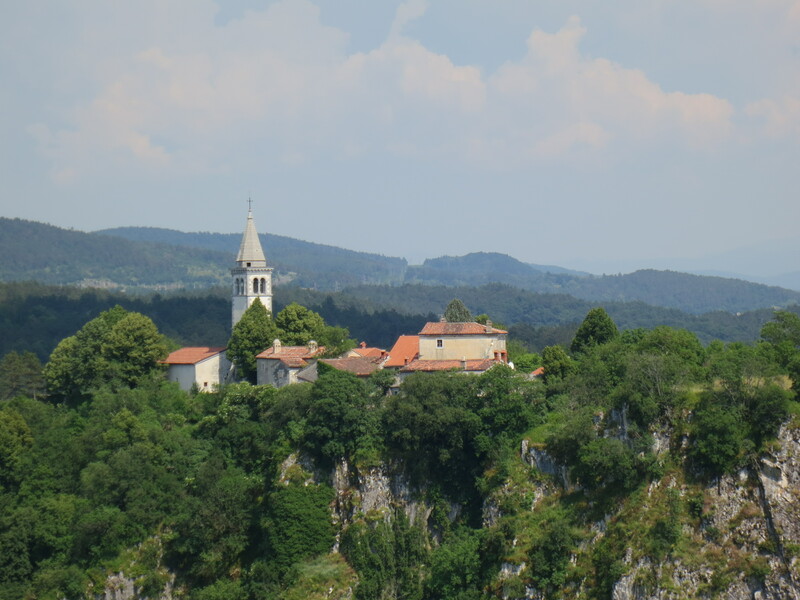 Slovenia, as a couple friends had told me, is absolutely beautiful, and it’s not quite popular enough yet to be overrun by tourists, so each place we stopped at was gorgeous and not very crowded. 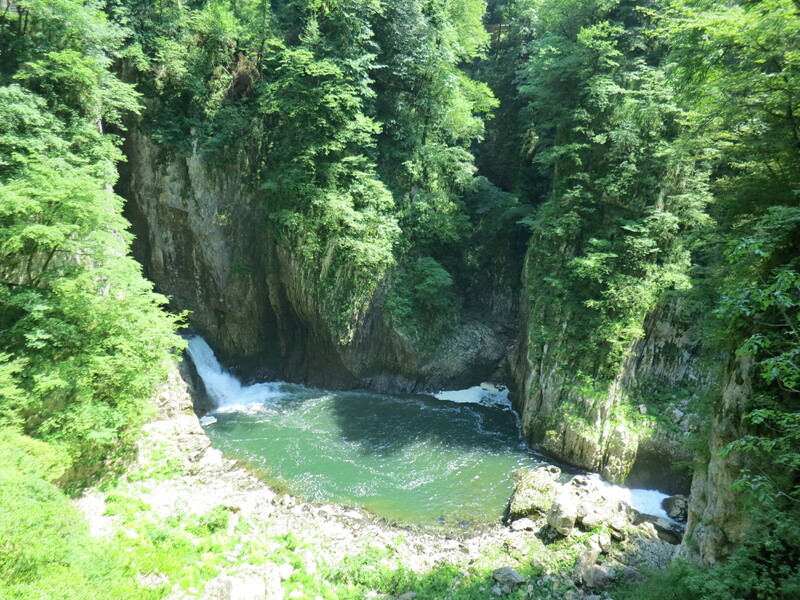 I joined four guys from the hostel in a van our gregarious tour guide drove around his home turf–a loop from Ljubljana to Predjama Castle, to Škocjan Caves, and Lipica stud farm. 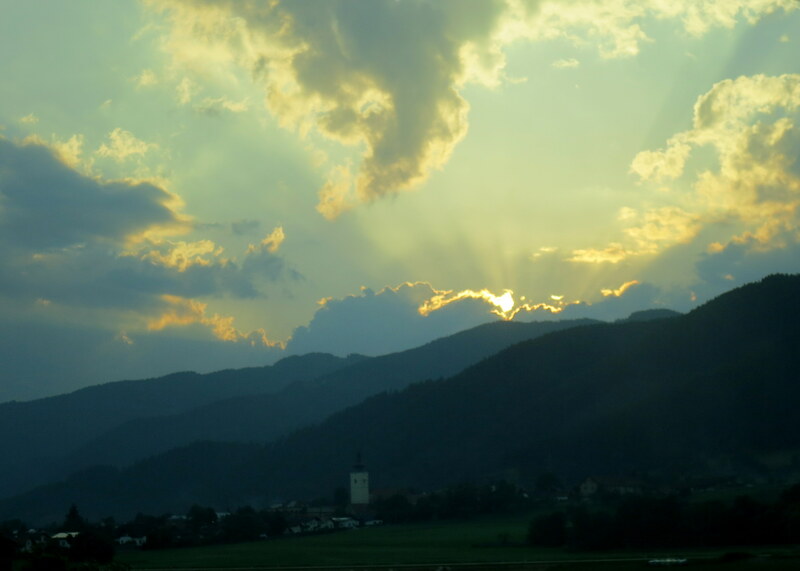 Later, a new friend and I from the hostel rejoined the guide to visit the town of Celje and the nearby lake for sunset. 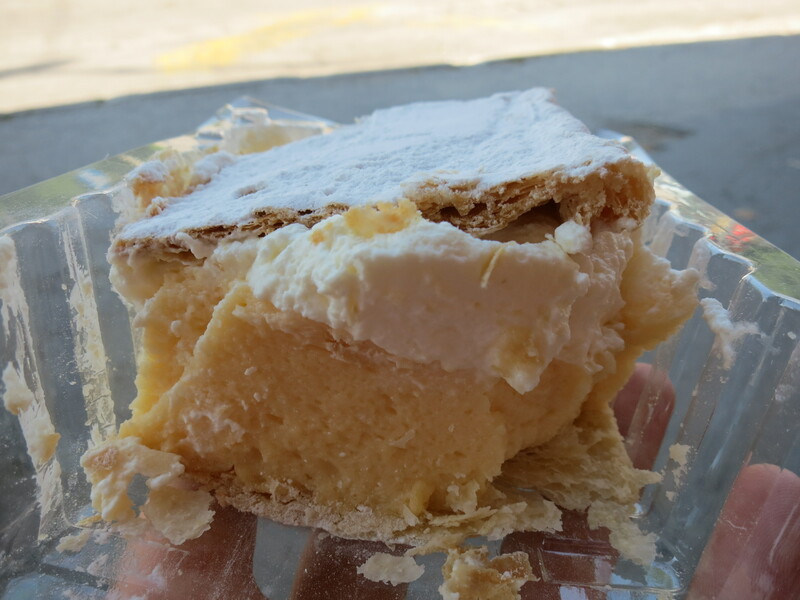 It was like a one-day advertisement for Slovenia–and it worked, we were all hooked. 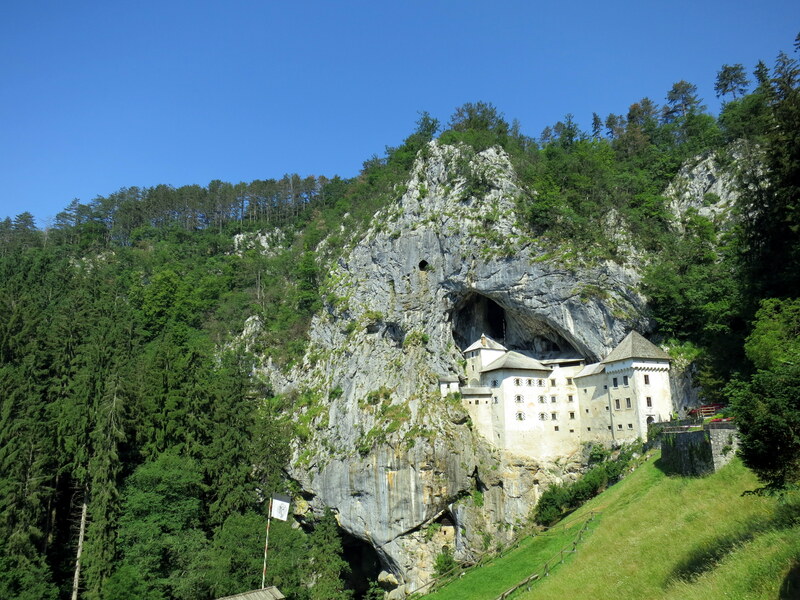 The approach to Predjama Castle looks like just a path up a hillside, with no castle in sight, and then you turn a corner and voila!–a castle built into the mouth of a cave. It’s an impressive construction, and looks about as impregnable as it is. 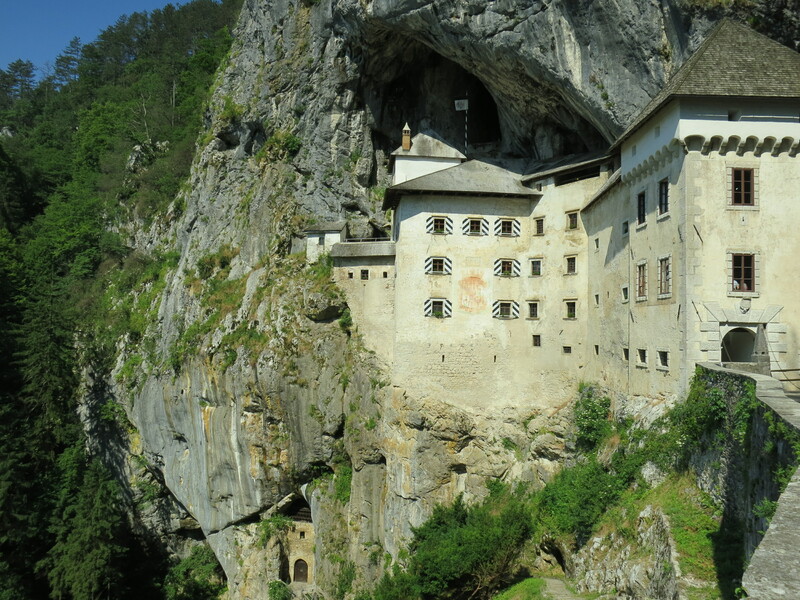 Back in the 15th century, the baron who owned it came under siege but suffered no hardship for a year and a day because of the secret passageway through the caves that allowed him to bring in fresh supplies. A servant betrayed him and he was shot by cannon out of his toilet–an ignoble but also kind of awesome way to go? 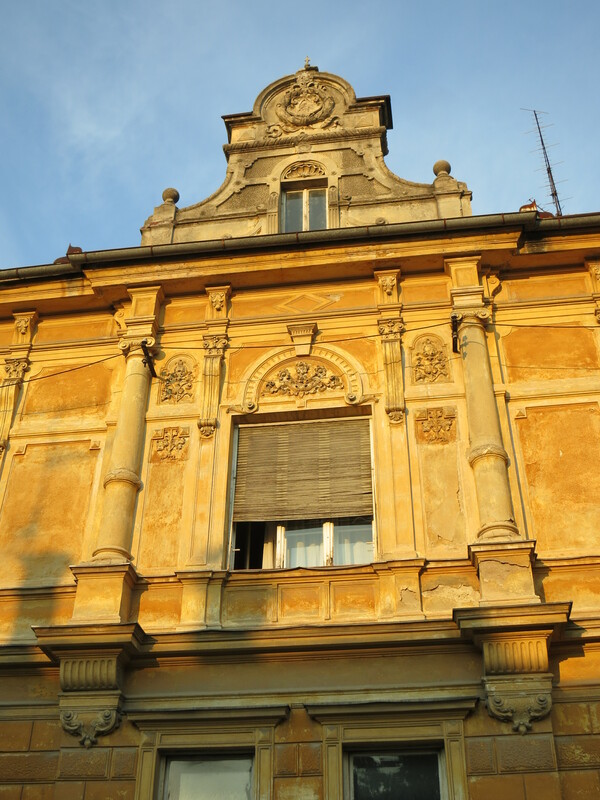 The castle underwent extensive changes in the next hundred years, and has remained in the Renaissance style ever since the late 16th century. 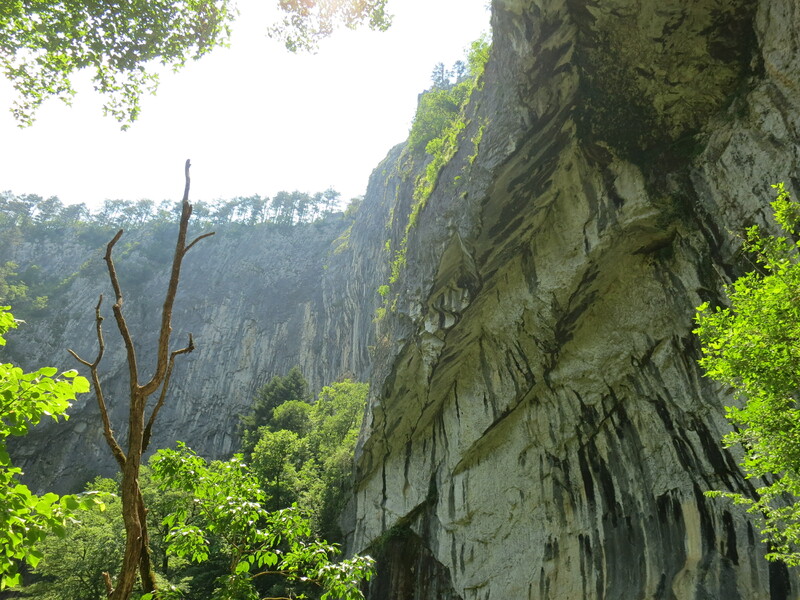 Škocjan Caves are a World Heritage site, a massive system of underground karst canyons (karst being the type of rocks found here). 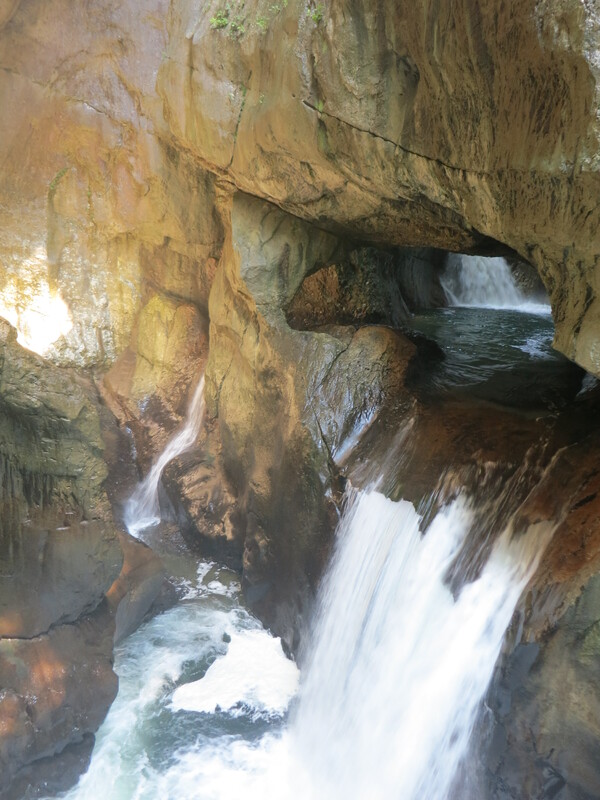 Reka River flows through some of the largest underground caverns in the world, and you can visit a couple of these caverns on a guided tour. Photos weren’t allowed, because apparently the flash can damage the rock, so we all took a bunch when we saw daylight again and our guide said it was okay. 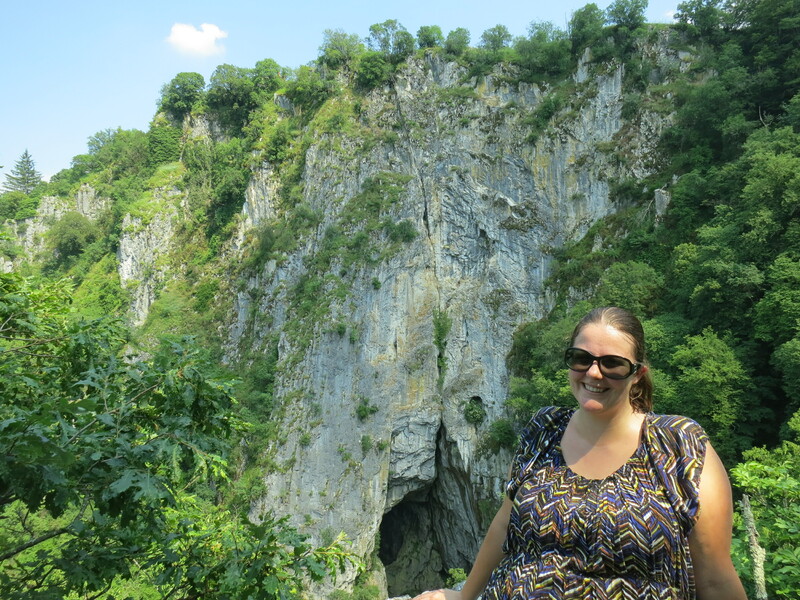 But go ahead and Google some images to get a sense of the size of these caves. They were breathtaking, and the water rushing through was at a magnificent strength and volume as well. 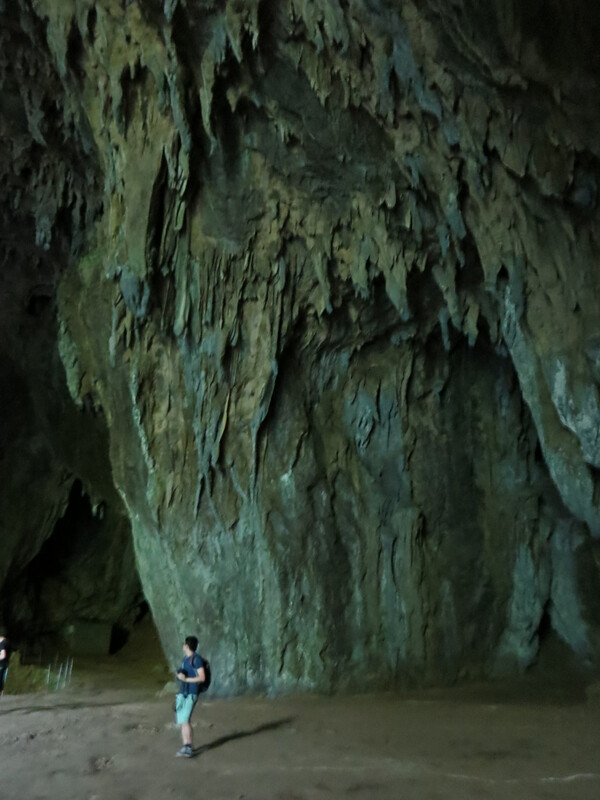 I’d say that this is probably the only caving tour you can go on if you’re claustrophobic, since even the smaller areas were pretty comfortable. 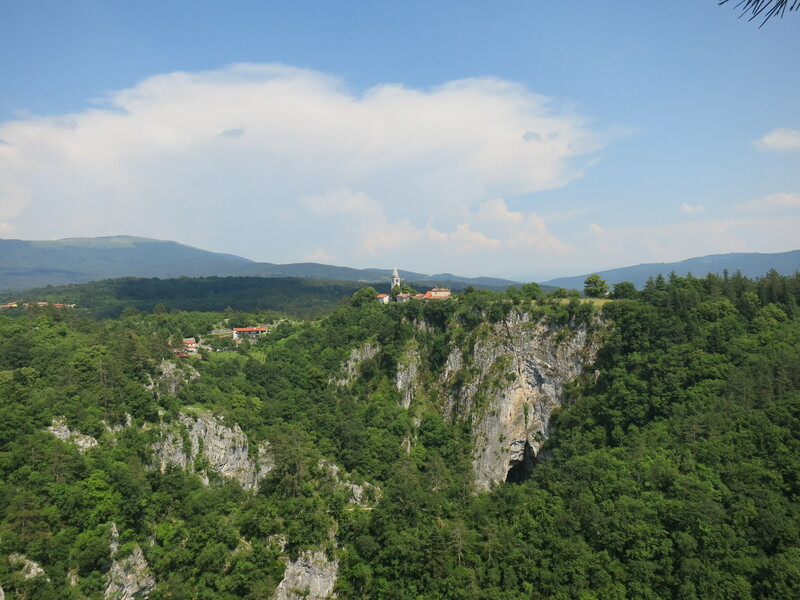 It’s just a whole city of stalagmites and stalactites and river rapids down there. After the caves, you can take a pretty direct route back to civilization, or you can do a mini hike through the hilly woods atop the caves. Our guide had scheduled in time for the hike, so we set off, and of course I took the longest. 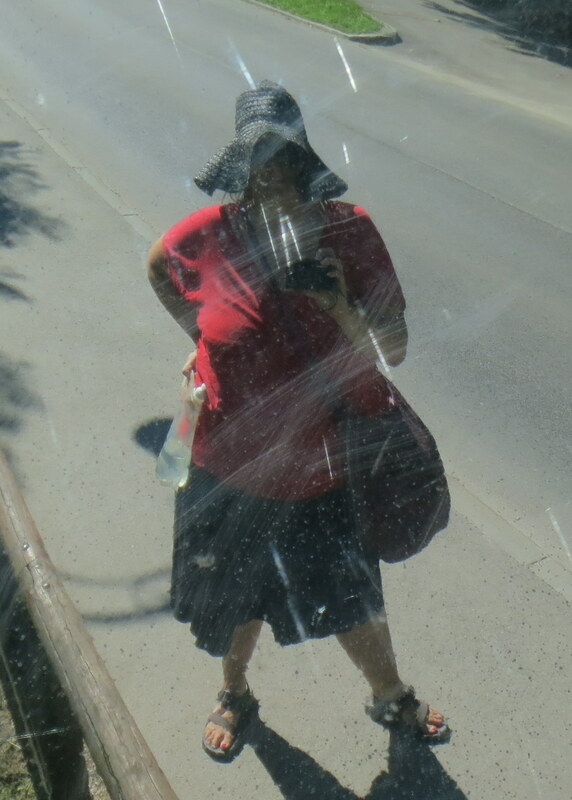 I’m just a slow walker, and I take a lot of photos. I warn people of this, but they always seem surprised anyway. 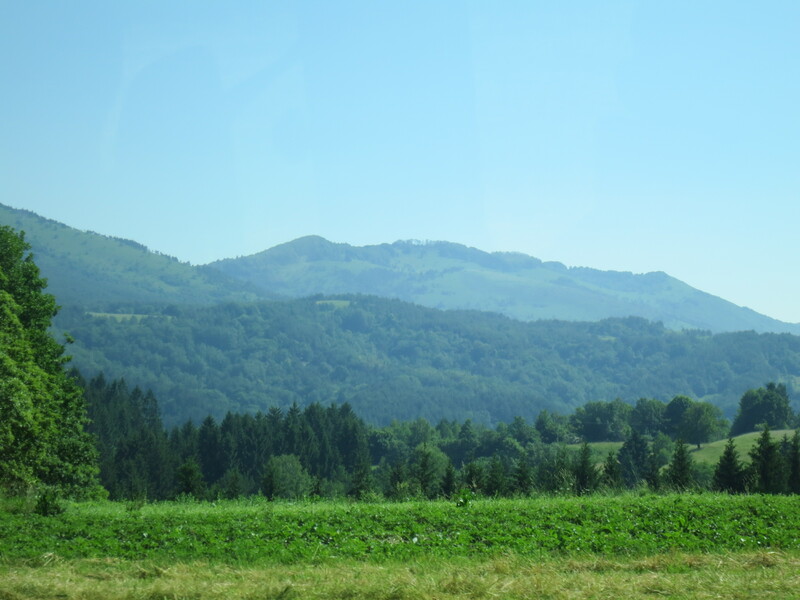 I was aware that I wasn’t the only one on the tour, so I kept moving, although the scenery was absolutely gorgeous so I was tempted to dawdle. 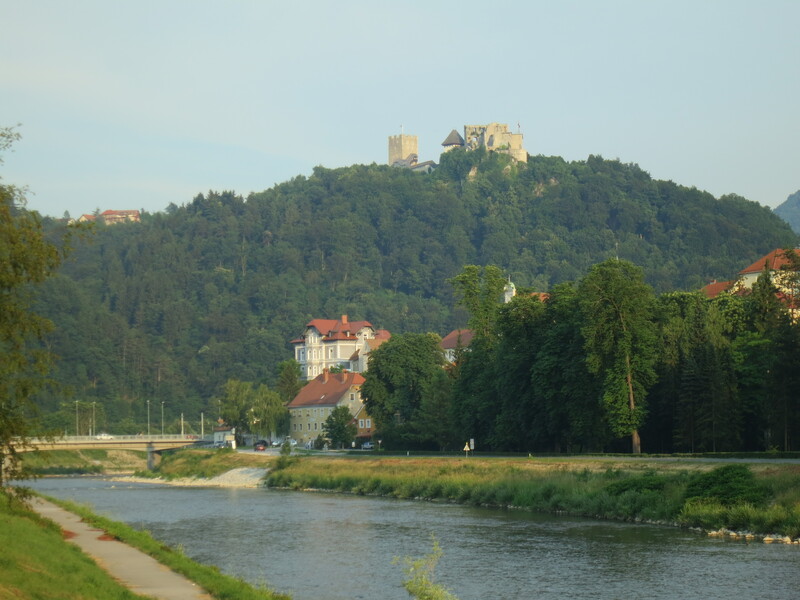 After one last look at the castle across the valley, we got back on the road to our last stop before Ljubljana. 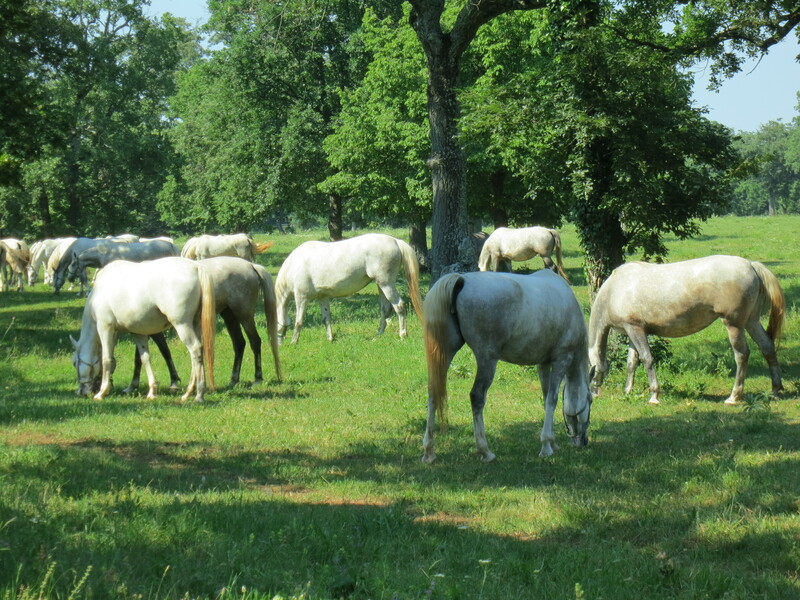 Lipica stud farm is where the Lipizzan horses have their start. 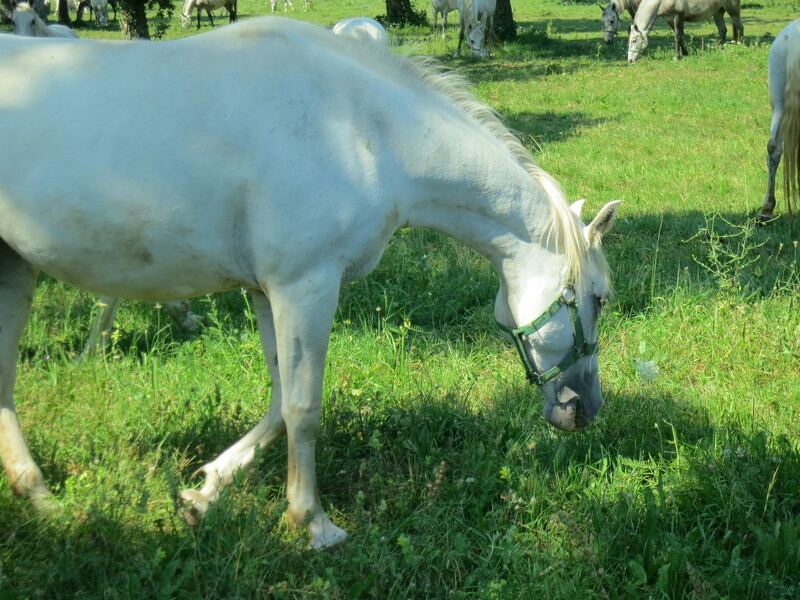 These white horses have been bred for centuries to be raised in the Spanish Riding School style of dressage, which is a very specific purpose, and apparently a very expensive one, as these horses are highly prized and the stud farm a place of pride for Slovenia. You can take tours of the grounds, or you can do what we did, which was stop partway up the private drive, get out and stand at the fence and gaze at the horses from there. They were mostly shy with us, but lovely to watch from a distance as they grazed and sedately walked around the huge grounds. 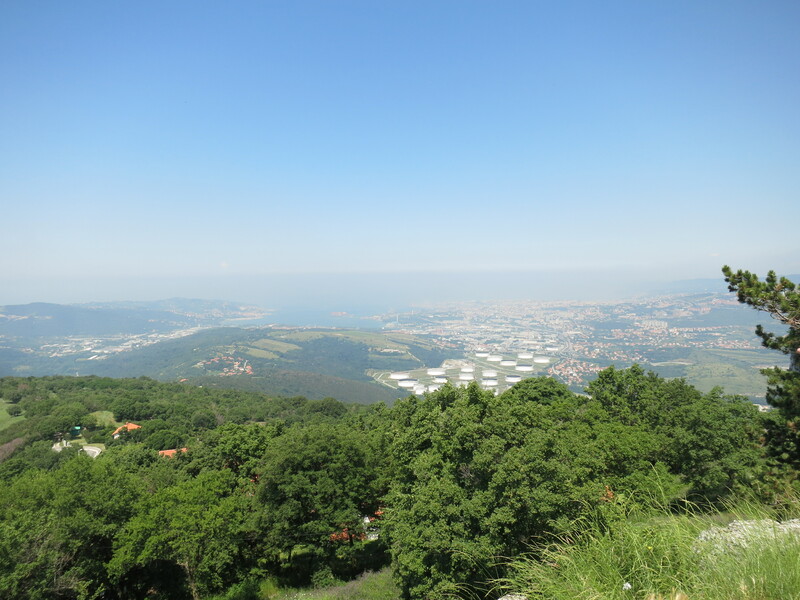 We stopped at a lookout point to get this view of Trieste in Italy, just across the border, and what little is left of the Slovenian coastline after Croatia and Italy took most of it. 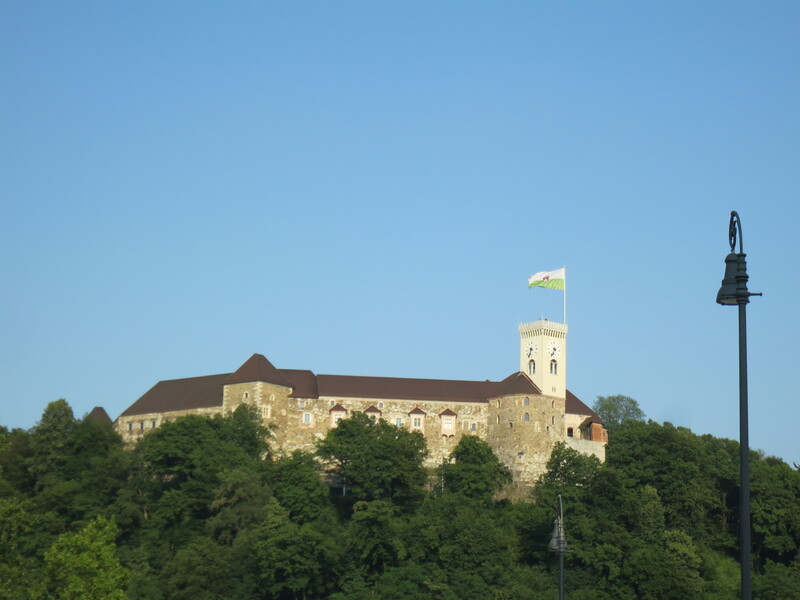 The town of Celje is about an hour’s fast drive northeast of Ljubljana. 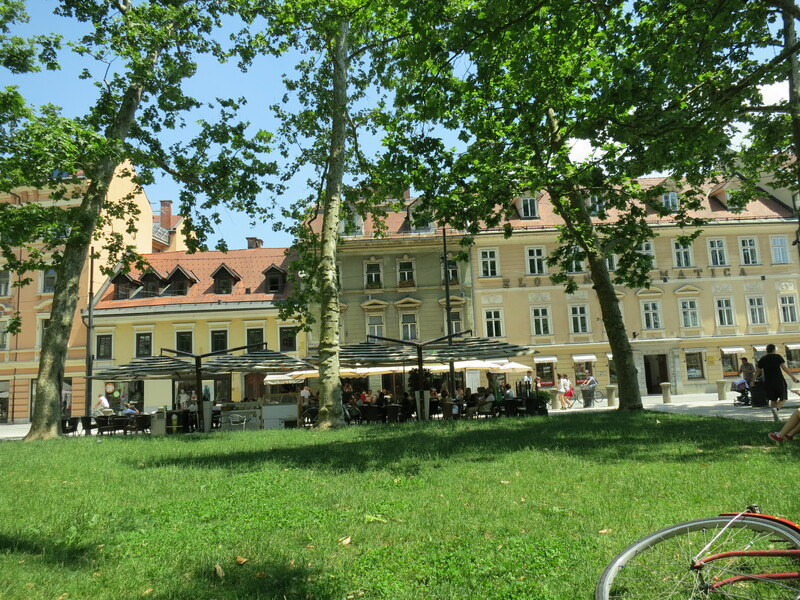 We walked along the Hudinja River as kids played in the last hours of daylight, we admired the 3/4-life-sized bronze statues scattered around town, and we had a drink in the shadow of buildings in the Viennese style. 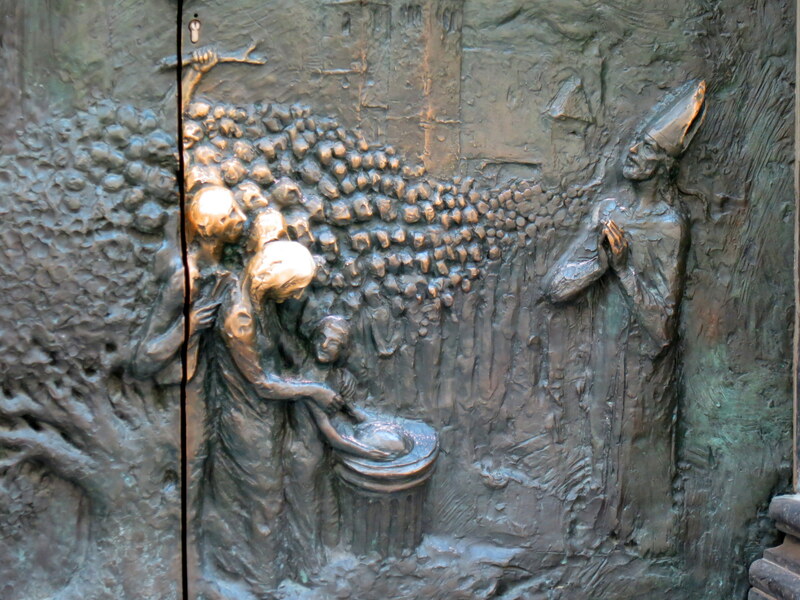 One of the statues is of Alma Karlin, a Slovenian traveler and writer who knew over TEN languages. She often wrote in German, until the rise of the Nazis, at which point she stopped writing in German in protest. She traveled around the world for a decade and established a language school, and is clearly someone whose writings I need to read immediately. 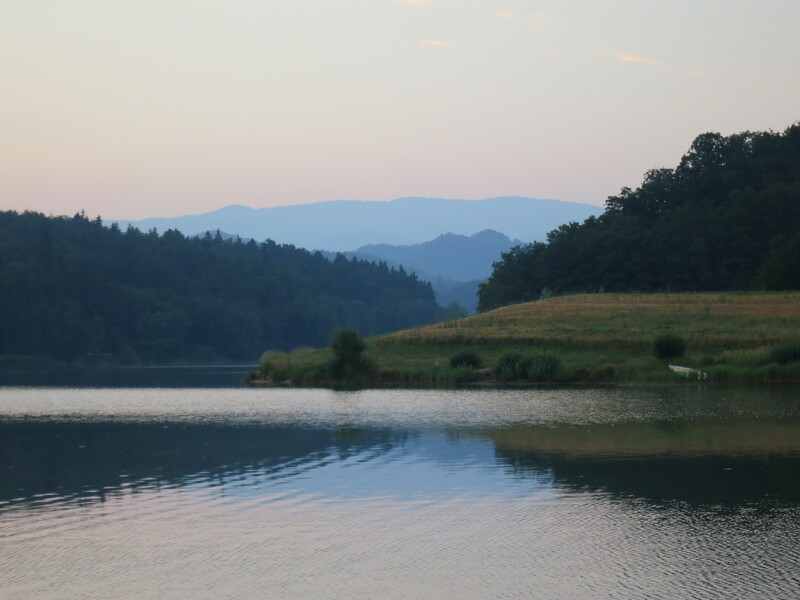 We ended the day at Šmartinsko Lake, a manmade lake with irregular borders so it looks more natural. Aside from slapping away mosquitoes, which let’s be honest has been part of every summer evening for me in the Midwest, I sat and had a totally peaceful experience, watching the sky turn pink and the distant hills blue, and seeing it all reflected in the still waters of the lake. 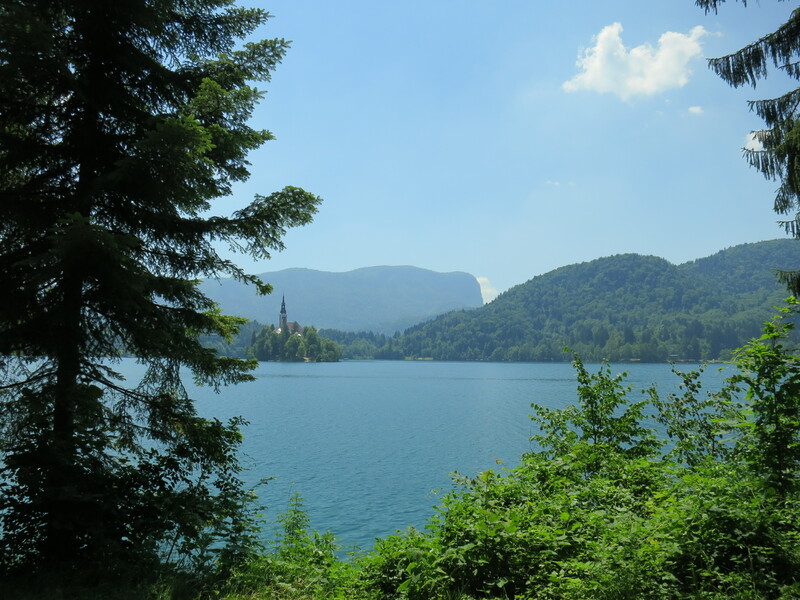 Our guide talked about how proud he is of his country and how much he loves Slovenia, and we just nodded along. Look at this place–how could you feel any differently? 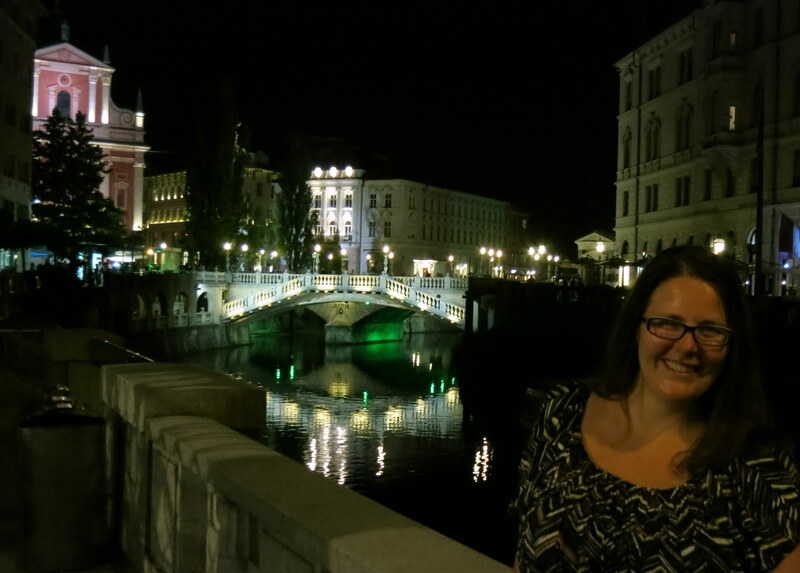 Wellington may be the coolest little capital in the world, but Ljubljana has to be the loveliest. 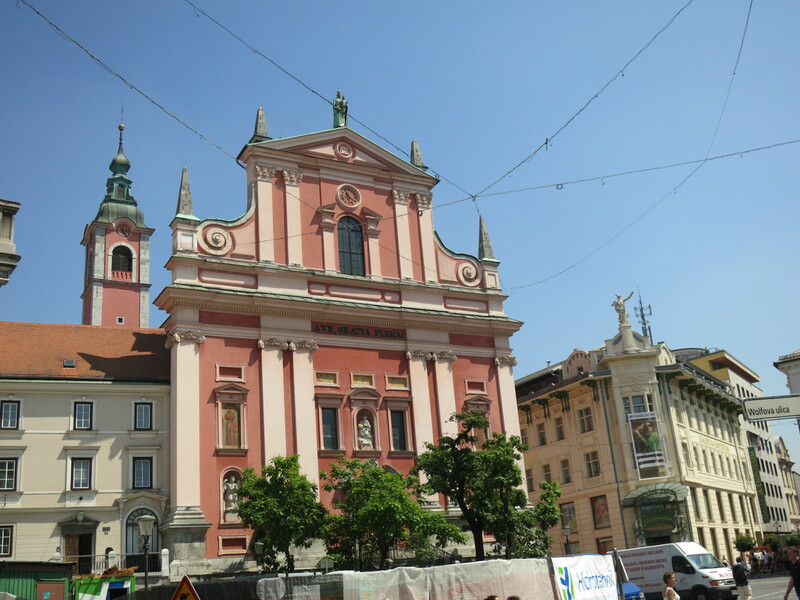 The small city sits in the center of Slovenia, on the Ljubljanica River, and it’s made up of a mix of Venetian and Viennese architectural styles, well-placed parks, a large cathedral, and a castle upon a hill. I went on a free walking tour with a guide who threw some dark humor into his spiel and then apologized, saying he’s a stand-up comedian and these get laughs from the locals but he has to remind himself they don’t work on tourists. Aw, keep trying Mr. Guide-man, let your morbid culture shine through. 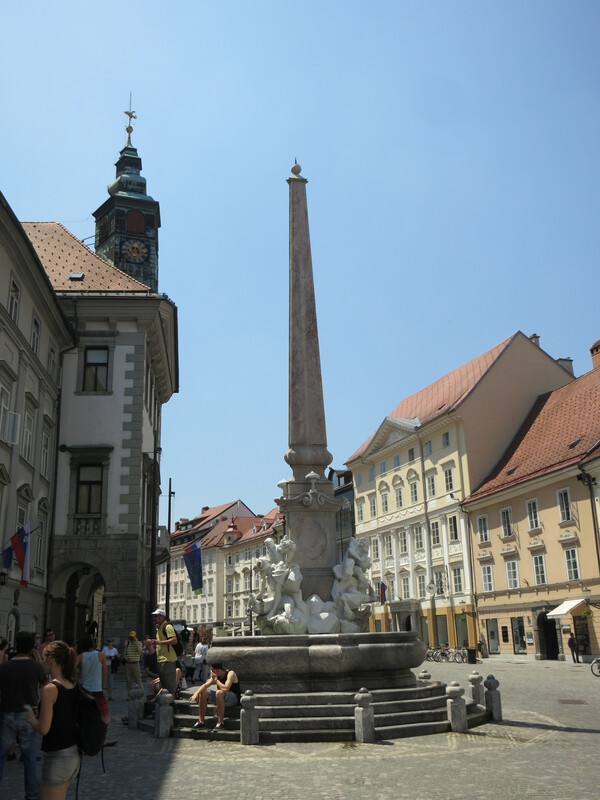 We started the tour in Prešeren Square, named after the national literary hero France Prešeren, who lived out his unhappy life in the first half of the 19th century. Prešeren wrote in Slovenian, which contributed to a sense of national identity for the country. 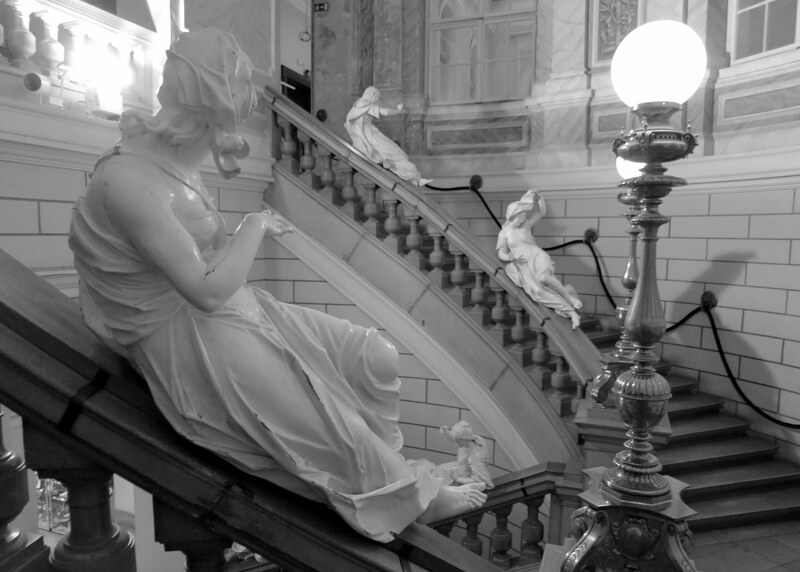 He also carried a torch for a young society woman, calling her his muse. 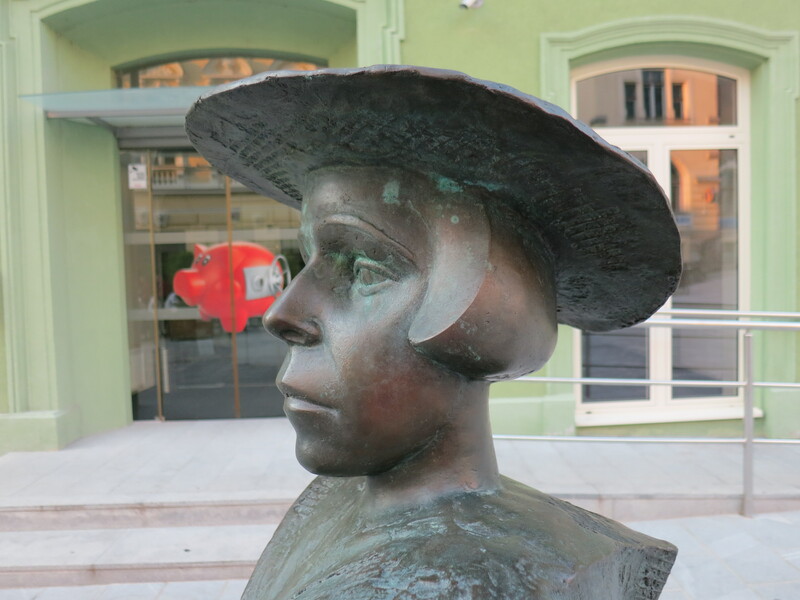 So much is made of his unrequited love for her that the statue of Prešeren in the square named for him gazes at a building across the square, which contains a carving of this young muse, so that they can look at each other for eternity. He was 33 when they met, and she was 16. Muse indeed. We crossed the Triple Bridge, designed by Jože Plečnik along with much of the rest of the city in the interwar period. Two bridges were built to flank the main one, to prevent bottlenecking in the city center. 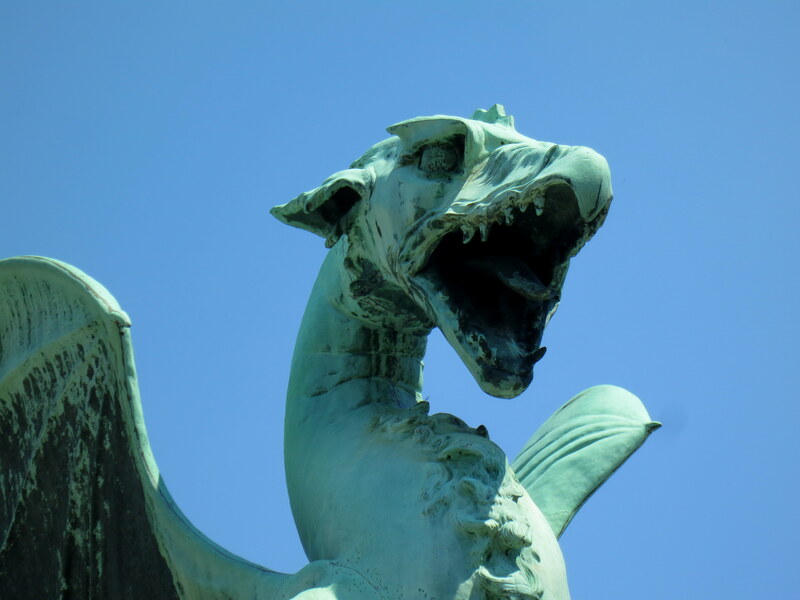 We walked along the river, past the fish market and produce market, until we arrived at a bridge guarded by an impressive bronze dragon. 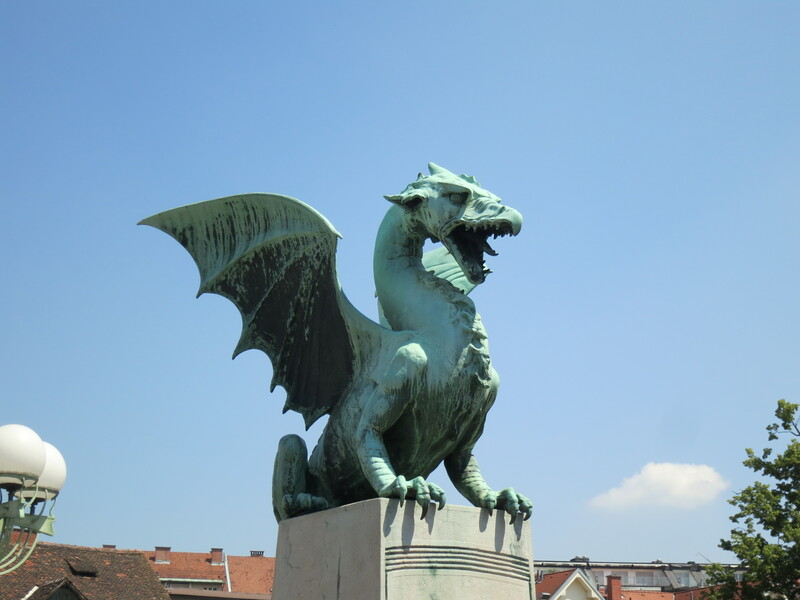 The dragon has become a symbol of Ljubljana, although its origins may have just been looking cool on a coat of arms. Legends tie it to Slavic stories of ensuring fertility, Greek myths of monster slaying, and Christian tales of paganism defeated. 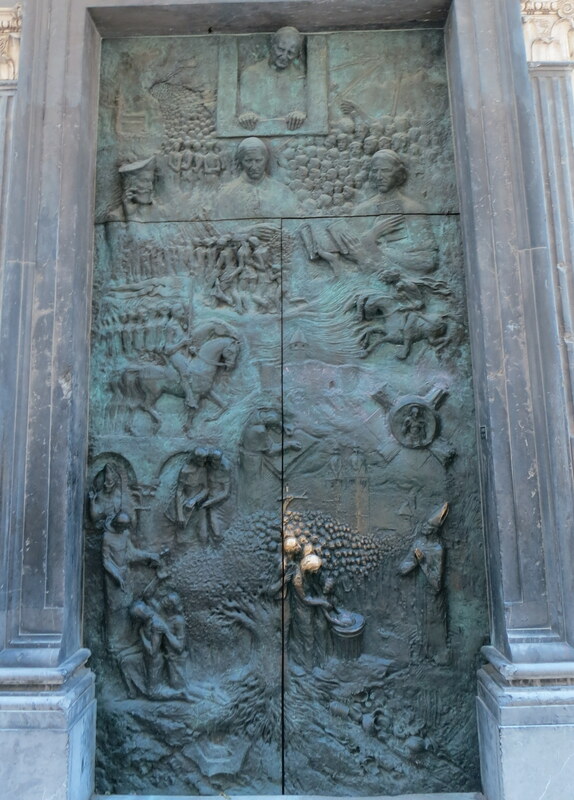 The cathedral of Ljubljana was visited by Pope John Paul II in 1996, and prior to his visit a large set of bronze doors was installed depicting the bishops of Slovenia preaching to large groups of people, overlooked by a carving of John Paul himself. Beyond the alley containing these doors, the street opens out to Town Hall and an uninspiring but popular fountain on the square. 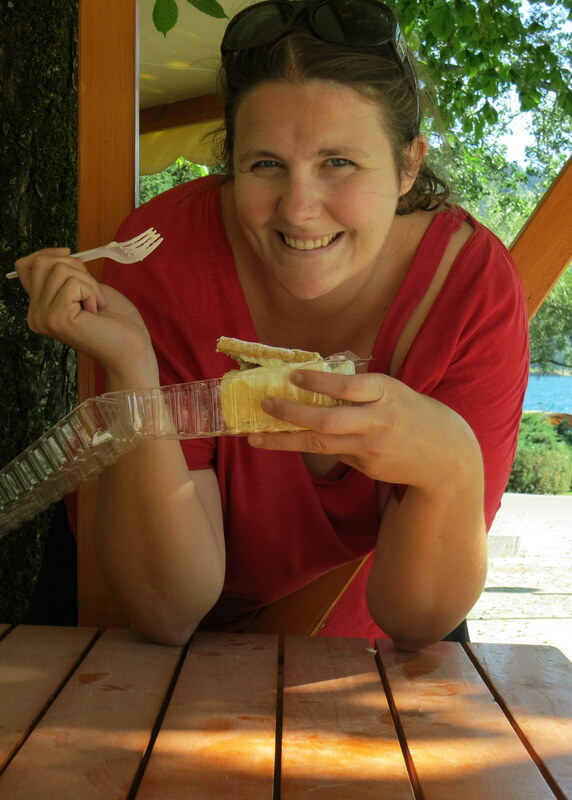 We ended the tour in a major outdoor music hall, where our guide dipped into politics for just a few moments, as anything concerning Communism and the Balkan Wars is understandably a touchy subject in this region. I visited the national museum to see the world’s oldest musical artifact, but when I got there, I saw a small sign informing me that the real thing was in storage, and this was a replica. 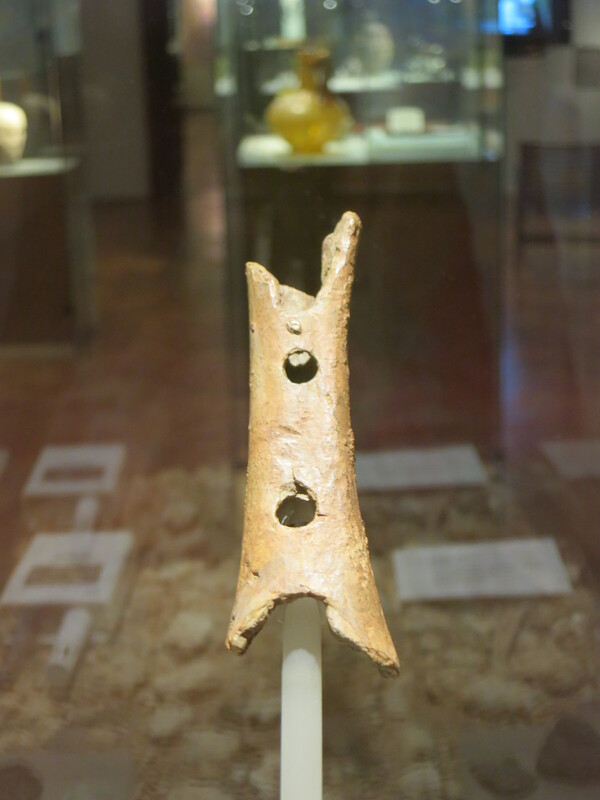 A little disappointing, but it’s still cool to know that the original flute has been dated to 45,000 years ago and is the first musical instrument to be confirmed as a Neanderthal creation. We’ve been musical since before we’ve been fully human. 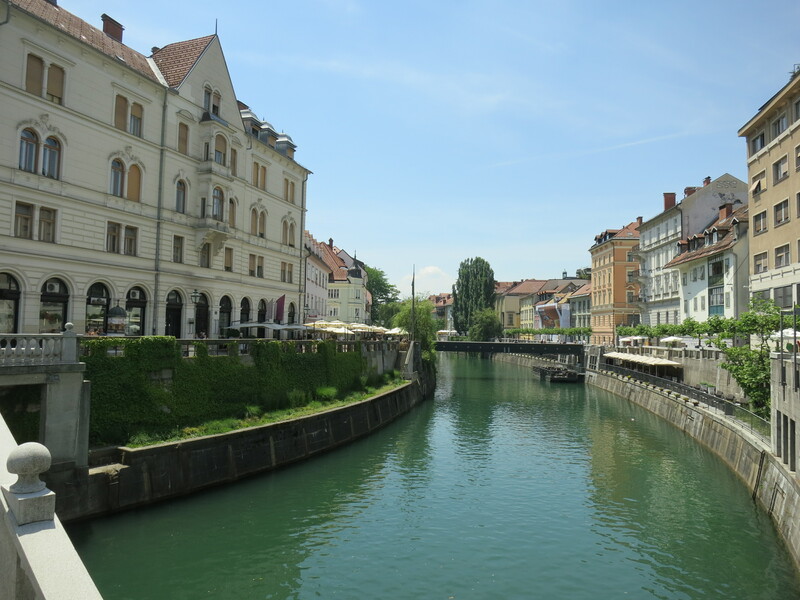 There’s more to see in Ljubljana on another visit–the castle and an artist’s district near the train station, to name just a couple things–and it only takes a glance through these photos to see that I can’t be far off in naming Ljubljana the world’s loveliest little capital. 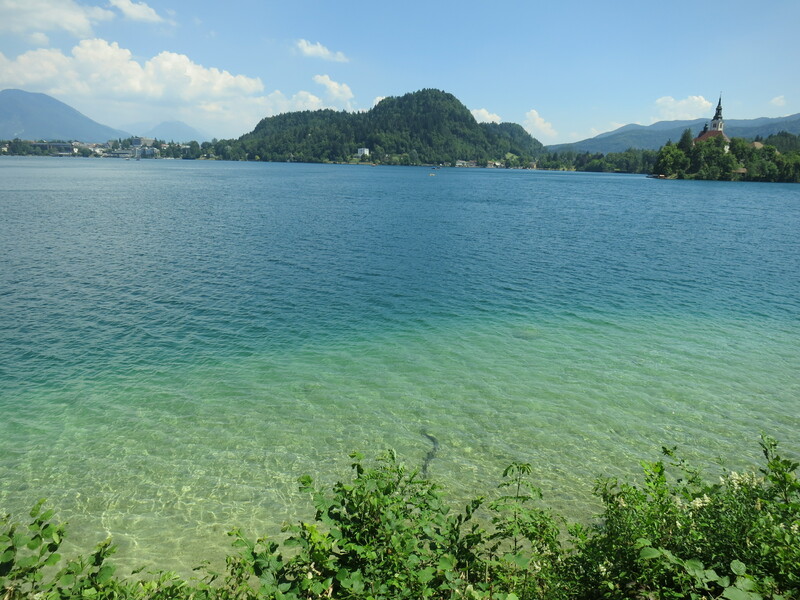 Everyone’s running marathons and jogging in fun runs, and, never one to let travel impede my recreational activities, I decided to do a walk here in Slovenia: The First Annual Lisa Findley Lazy Lake Day 5K. I finished in the top five and even got a prize for it. 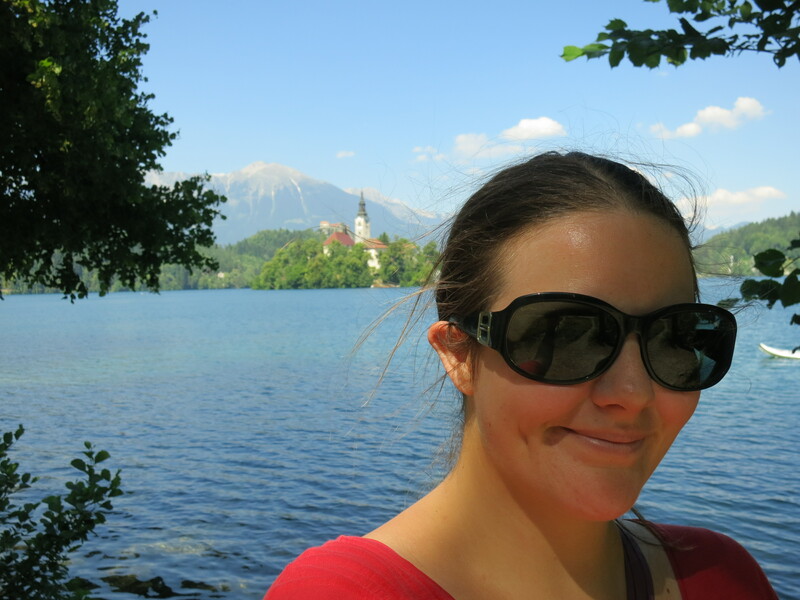 I can definitely recommend this approximately 5 kilometer trail to you if you’re ever in the Lake Bled area. First, I made sure I was in the right gear. Then, I took a look at the competition. 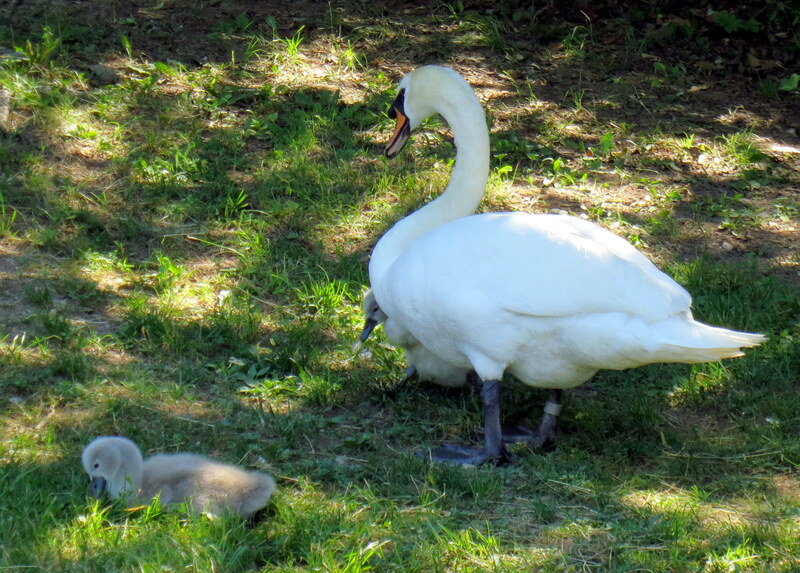 I could take the babies, but the mom would give me a run for my money. Soon it was time for a lunch break while contemplating the rest of the course. At about the halfway mark, everyone took a dip to incorporate some light triathlon training. You can’t NOT swim in that. Europeans in all their speedo glory. I admit I got a little distracted by the views. 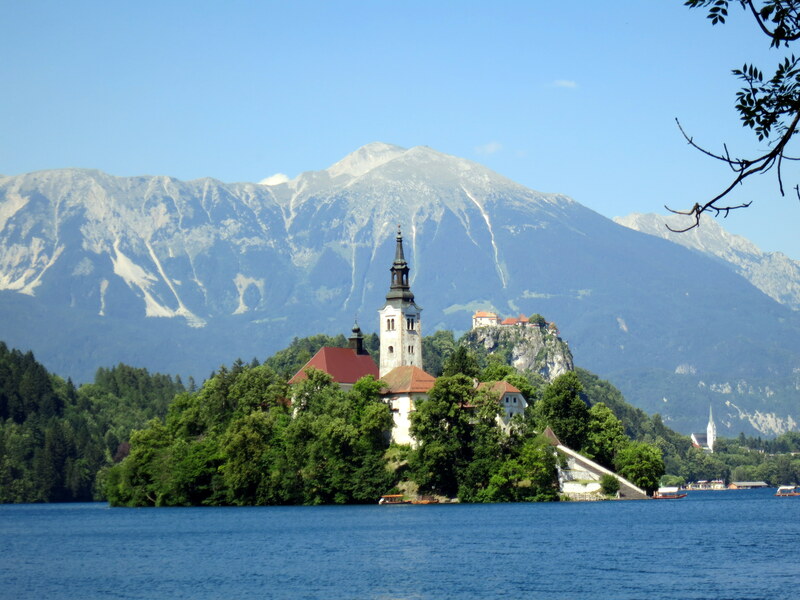 The monastery on the only island in Slovenia. After only one lunch break, one swim break, and one reading break, I easily made my target time of 4 hours. Time for a prize! If all 5Ks were like this, I’d be a champion.